(1 Customer Reviews) | Write Review 12 issues per year Vegan Living is the must-have magazine for the latest vegan recipes and taste innovations, ethical fashion and beauty, vegan travel reviews and interviews with chefs, businesses and celebrities who are making a splash in the vegan world. Available as an app, Vegan Living is for anyone who is already vegan, or thinking about becoming vegan, with exciting and healthy easy-to-make recipes to inspire you. Less hippie and hemp, but more ethical and elegant, Vegan Living will appeal to everyone passionate about cooking great food with delicious, tasty ingredients. Never judgmental and always positive, Vegan Living focuses on enjoying a healthy, happy life, with every issue packed with seasonal recipes and food news, including the best markets, vegan events and pop-ups going on across the UK. Each month we’ll answer your health queries, offer beauty and fashion tips as well as a great guide to where to eat out and what to order. Buy Vegan Living for inspirational, fuss-free vegan recipes and to help you live your best life, every day. Now it's June we need food that's light, delicious and can easily be carried into the garden. That's why in this issue we've got healthy, seasonal foods that glow with summer, indulgent, sunshiny puddings, light Indian curries and exotic Moroccan delights. It's also the month that festival season starts in earnest so we're celebrating the summer's best events for vegans with our round up of the weekends you can't miss and if you want to recreate your vegan street-food at home later, we've got it covered. Whisk up Pad Thai, Southern fried tofu, big burgers, 'fish' and chips or spicy tacos. You'll also meet Amy who sells vegan ice cream from a 1950s van, have the latest vegan fashion, beauty and health tips and a selection of places to eat out where nobody will look at you funny for not wanting cheese! Enjoy the issue! 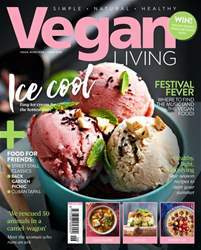 Vegan Living is the must-have magazine for the latest vegan recipes and taste innovations, ethical fashion and beauty, vegan travel reviews and interviews with chefs, businesses and celebrities who are making a splash in the vegan world. You'll receive 12 issues during a 1 year Vegan Living UK magazine subscription. I like this magazine, it has a wide range of different features, although I do prefer Vegan Life. There are so many vegan magazines these days, it's so exciting to have a choice! 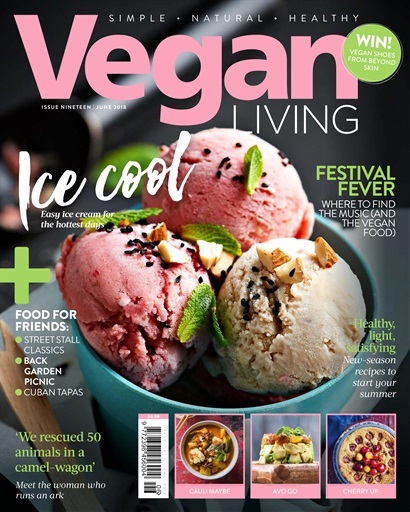 You'll receive 12 issues during a 1 year Vegan Living UK magazine print subscription.